THINK SAFETY: When installing an antenna for your crystal radio, be sure there are no electrical wires or electrical equipment close to you that could possibly come into contact with the radio antenna wire. Take necessary precautions to protect yourself from falling, electrical shock, and other dangers. Have an adult to help you. THINK SAFETY: For lighting protection, the antenna should be left disconnected from the radio when not in use, connect the antenna lead to your outside ground wire when not in use. Or install a good quality lightening arrestor. It's important to understand that a crystal radio, the antenna and the ground connection all function together as a system. Change any one component and the radio will perform differently. Using a water pipe as a ground will only work if the water pipe is made of metal. Newer homes generally use plastic/PVC pipes these days. You may need to make your own ground connection by burying some steel pipe or steel rod into the ground. The best thing to use is Copper Pipe. Use 4 feet of either copper or steel pipe/rod, bury it "vertically" into the ground leaving only a few inches exposed above ground to connect your ground wire to. If possible bury the pipe in a spot were the ground stays moist. NOTE: It's not a good idea to use your homes electrical system ground for your radio, this can cause alot of electrical noise interference on your crystal set. There are easy ways to set up a quick & effective antenna system into a tree top. I've had very good results by using an insulated copper wire (heavy rubber insulated type wire) Like the wire one would use for replacement on kitchen appliance or lamp electrical cord. This wire can be purchased at most any hardware store. 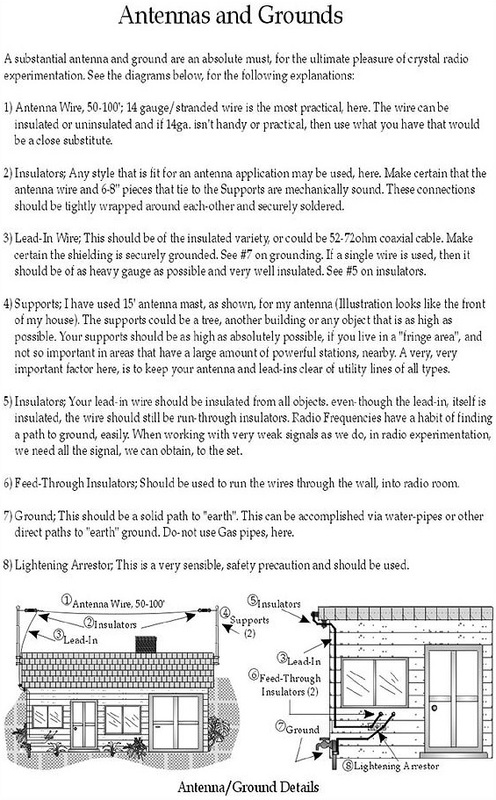 Keep in mind, the higher you can place your antenna wire into the air the better it will perform for you. 50 to 120 feet of wire length is best. You will need a tall tree to hang the wire into. Using a good casting fishing pole, with a heavy lead sinker, cast your fishing line (good quality 12 pound test line) up and over the tree top. Once you have the fishing line over the tree top tie your insulated wire to one end of the fishing line. Now pull the fishing line over the tree, this will pull your antenna wire up & over the tree top! The wire will be hanging in an inverted V configuration over the tree. This method does work very well and is fairly fast & easy to put up. If you have 2 trees you can use this same fishing pole method to stretch your insulated wire over the top of both trees so the insulated wire spans between the 2 tree tops. This method will work even better then the one tree inverted V system. 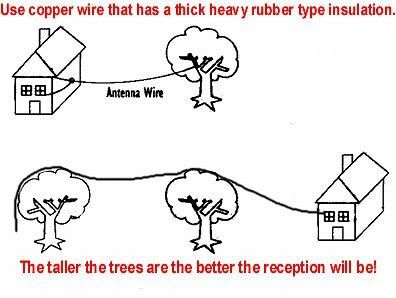 If you really want to get serious about getting your antenna wire as high as you possible can into very tall trees, assuming you have no desire to be climbing tall trees, then try this. Instead of using a fishing pole, use a powerful bow and arrow to shoot the fishing line over the tree tops. I've been able to get my antenna wire up into the tree tops around my home that stand over 90 feet tall using the bow and arrow method. Once you have your antenna wire hanging at these heights, it will perform exceedingly well!! Don't try to shoot the wire with the bow into the tree, the wire is much to heavy for the arrow to carry it. Also keep in mind, the heavier gauge of fishing line you use the more drag it will create on the arrow. I've found that a good quality "12 pound test" fishing line is best.